The Lexcel practice management standard is only awarded to practices that meet the highest management and customer care standards. Lexcel accredited practices undergo rigorous independent assessment every year to ensure they meet the required standards of excellence in areas such as client care, case management and risk management. This accreditation provides a flexible, supportive management framework to help practices develop consistent operational efficiencies and client services, manage risk effectively, reduce costs and promote profitability. 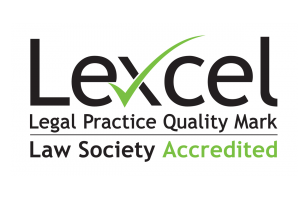 We are proud to be accredited by the Law Society’s Lexcel scheme as it shows our excellence in legal practice management and client care. The firm was committed to achieving this sought after accreditation to clearly show existing and potential clients the quality of service the firm is able to deliver. It also shows the firms empathy towards clients to ensure they receive the best client care possible. For further details about the Lexcel scheme please click this link.